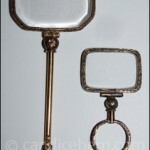 Welcome to the Bridgerton couture collection. 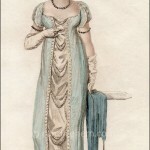 With the help of Candice Hern, Regency author and expert extraordinaire, I’ve selected dresses from her collection of Regency fashion plates that I think my heroines might have liked. While you’re here, don’t miss the opportunity to explore Candice’s website. 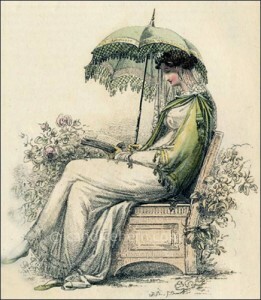 You’ll find a wealth of information about the Regency era, especially on her Regency World page, and her collections are not to be missed. And as for her books–they are simply delicious. If you’re looking for a new author to try, look no further. She’s one of my absolute favorites. 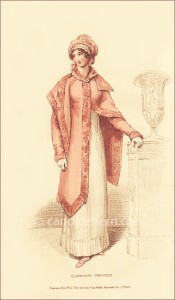 Click on all fashion print images to see larger versions. 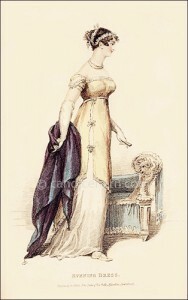 Unlike the other Bridgerton heroines, Sophie would not have had a stylish wardrobe until after she married, and even then she would not have had much use for fancy ball gowns. I myself am not that crazy about the ornamentation at the bottom, but I think that after years in shabby clothing Sophie would have loved it. This would have been just the sort of dress she’d have worn to entertain company at her home in the country with Benedict. 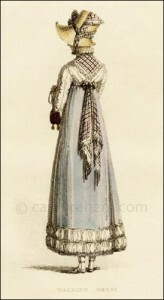 “Frock of white tissue gauze over white satin, ornamented round the border in a novel and unique style with white satin flutings. Opera hood surmounted by a full garland of roses and lilies of the valley. Blush colour or pearl grey slippers; and white kid gloves. I just love this walking dress for Sophie! 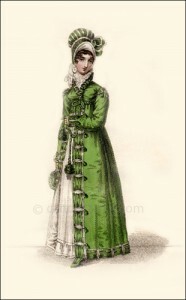 She’d have gravitated toward the green to match her eyes, and the dress has gorgeous detail without being too fussy. Plus, the boots would have been very practical for country life. For Kate, fashion is all about economy. The Sheffields don’t have money to burn, and Kate will need to make her fashion budget go as far as possible. I like this ensemble for Kate because it’s not too frilly and girlish. Kate might be in her first season “out,” but she has always very much seen herself as Edwina’s older sister, and she would have felt uncomfortable if she dressed in as youthful a fashion. Plus, the model here has her hand on her hip, which just seems so Kate. 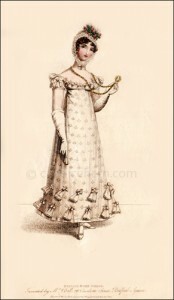 The next two are different dresses, but there are enough similarities that a young lady might use the same accessories (doesn’t the bonnet look the same?) Kate is practical at heart, and I like to think that even after she became the fabulously wealthy Viscountess Bridgerton, she would not have spent lavish sums of money on her wardrobe. Also, after two blue covers for The Viscount Who Loved Me, I can’t help but see Kate wearing blue clothing. A book makes a great accessory for a serious-minded young lady, but Kate’s actually got Lady Whistledown’s Society Papers tucked inside. (She doesn’t like to admit that she loves reading it, but trust me, if she were alive today, she’d be devouring US Weeky at the supermarket checkout line.) This dress is from 1813, but the Sheffields would not have had enough money to completely redo Kate’s and Edwina’s wardrobes in 1814. A simple day dress like this would be where they would be most likely to cut corners and economize. I adore the green, too—it’s one of the colors I chose for my website. Daphne’s not exactly a tomboy, but nor would I call her a girly-girl, and I always pictured her wearing clothes with a simple elegance. 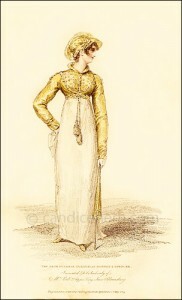 This evening gown gets its glamour not from frills or flounces, but from the simple drape of the yellow over-dress. The bows on the side add a nice touch, but without being overbearing. And something about the hair seems just perfect for Daphne! I’m not sure why this carriage costume seems so perfect for Daphne. I think it might be the color, which reminds me so much of the cover of The Duke and I. I can see her wearing this after she is married, in her new life as a young duchess.